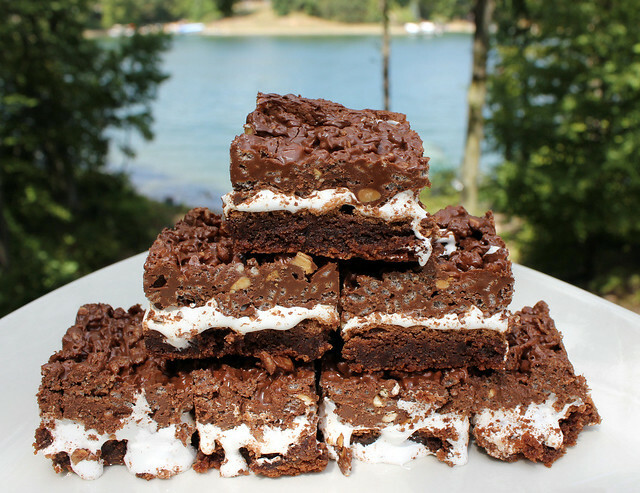 Lake House Brownies are kind of a big deal in my family. 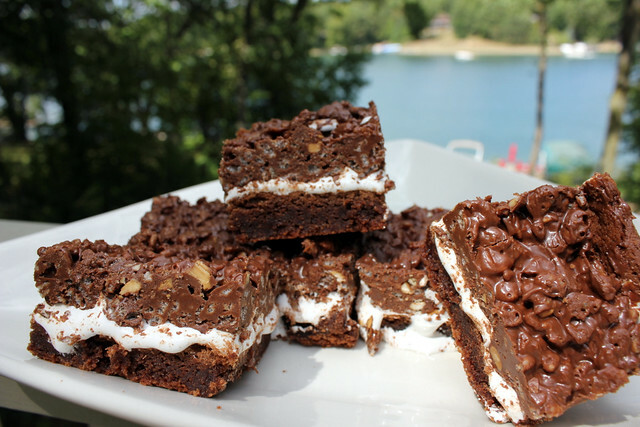 I am sure they had a different name at one time but we started calling them Lake House Brownies a long time ago because we always seemed to have them at the lake and the name stuck. My aunt Pam started making these years ago to bring to the lake in the summer. 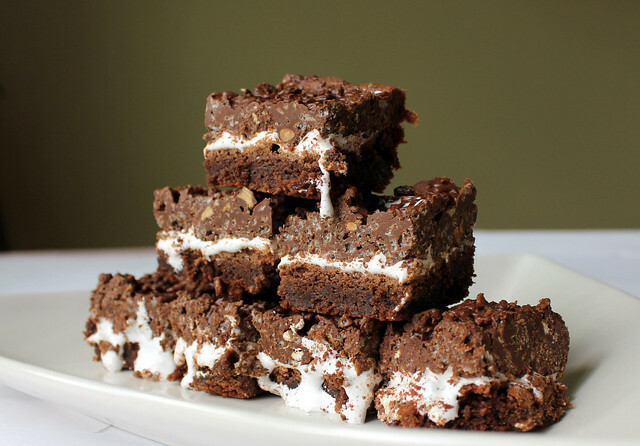 Everyone always lost their mind over those brownies. We pretty much told Aunt Pam that she was not allowed back unless she came with Lake House Brownies. Not really. Well, kind of. My brother had his bachelor party at the lake with about 30 guys. No joke, 30 guys stayed for the weekend and consumed crazy amounts of bacon. There was probably beer involved, but that is just a good guess. I just remember hearing about the bacon. Anyway, my aunt was driving through and brought a pan of brownies. She hand delivered them to my dad and told him that he better hide the pan. I think the last time she brought them my dad never got a chance to get one. Well, my cousin Scott heard there were Lake House Brownies under the bed and pulled them out for everyone. Sadly, my dad never got one. It is kind of a sore spot to this day. You really have to watch Scott. I wanted to take a picture of the brownies this summer for the blog. Apparently I waited a little too long. When I looked in the refrigerator this is what I found. I guess no one wanted to be responsible for taking the last piece. What I am trying to say is that these brownies are really good. Insanely good. How could you go wrong? 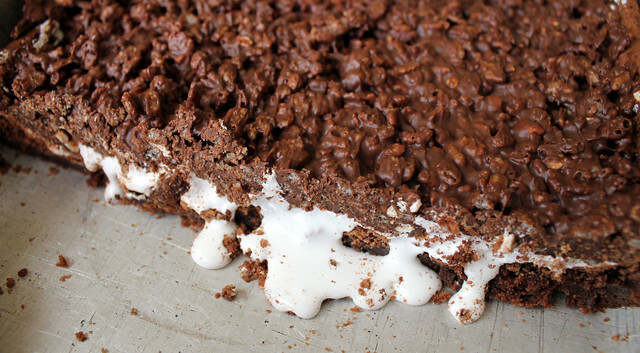 Homemade brownie bottom, marshmallow cream, and a topping of chocolate, peanut butter and rice cereal. Amazing. The Perfect Pairing for this recipe is an eight cup microwaveable bowl, like the one by Pyrex. This seems like such a simple tool but it is one thing I would not be without in my kitchen. It is great to melt the chocolate and peanut butter, and is large enough to stir in the rice cereal. It always cleans up easily in the dishwasher. Gotta have it. Preheat the oven to 350 degrees F. Grease a 9x13 inch pan. Cream the butter and sugar in a mixing bowl until well combined. Add the eggs one at a time, mixing between each addition. In another bowl whisk the cocoa and flour. Add the flour mixture to the egg mixture in batches until combined. Finally, add the vanilla and salt and mix until combined. Pour the batter into the prepared pan and bake for 25-30 minutes until set in the middle and the edges start to pull away from the pan. Allow to cool. Once the brownies have cooled, spread the jar of marshmallow cream over the top. In a large microwaveable bowl melt the chocolate chips and peanut butter. Once melted, stir to combine. Fold in the rice cereal. Spread this mixture over the marshmallow cream. Refrigerate until set. I totally agree, sometimes a brownie is better left alone. I hope you try and love them! Yum-yum-yum! Love that poor lonely brownie in the corner of the empty baking pan! Thanks everyone! I don't think you will be disappointed! This looks great. I liked the story of the brownies...made me chuckle.